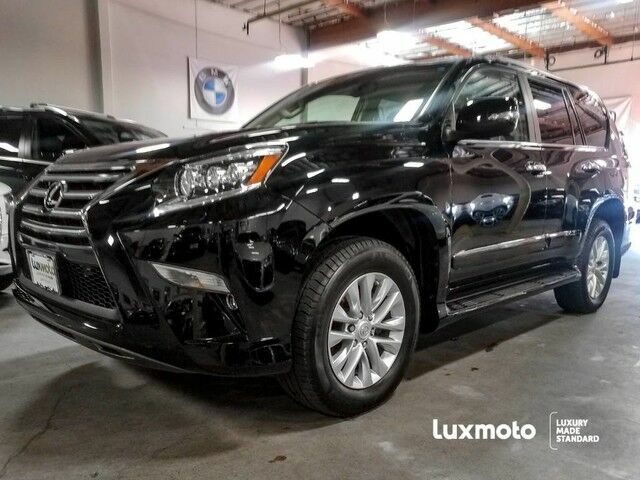 **Carfax Certified 1-OWNER**, **FACTORY WARRANTY**, **LEASE RETURN**, Lexus GX 460 Premium, **AWD ALL WHEEL DRIVE**, **3RD ROW SEATING**, **NAVIGATION**, **ENHANCED BLUETOOTH**, **HEATED/COOLED SEATS**, **BACK UP CAMERA**, **SATELLITE RADIO**, **BLIND SPOT MONITOR**, **MOON ROOF**, **SMARTPHONE INTEGRATION**, **USB & AUX PORTS**, **MUSIC STREAMING**, Heated 2nd Row Seating, Heated and Power Folding Mirrors, Lexus Premium 12 Speaker Audio System with 5.1 Surround Sound, AM/FM/SirrusXM/CD/DVD Stereo, Front and Rear Parking Sensors, Power Front Seats with Driver Memory, Power Tilt/Telescoping Steering Column w/Auto-Tilt Away, Cross Traffic Alert, Proximity Key For Doors And Push Button Start, HDD Navigation System w/Advanced Voice Command, Lexus Enform Safety Connect, Rain Sensing Wipers, Dual-Zone Climate Control, Xenon HID Automatic Headlights, LED Daytime Running Lights, Fog Lamps and much more. Come take a look at this Amazing GX in our Indoor Showroom. The GX 460 is more like a truck than a car-like crossover utility vehicle. It's closely related to the Toyota 4Runner -- so it has body-on-frame construction, an asset for anyone who tows regularly. The GX otherwise stands out for being especially well-equipped with both luxury-car comforts as well as useful off-road aids and safety-tech features. It might also prove more maneuverable and manageable versus a full-size luxury SUV such as a Cadillac Escalade or Lincoln Navigator. Interesting features of this model are comfortable seating, Rugged body-on-frame construction, towing ability, available tech and safety features, luxurious interior, and strong powertrain.